Paul Gustave Doré (January 6, 1832 – January 23, 1883) was a French artist, engraver, and illustrator. Doré's commissions include works by Lord Byron, Rabelais, Balzac, Perrault, Milton, Dante and Edgar Allan Poe. Doré was an internationally known during his lifetime and authors such as H. P. Lovecraft have praised his work. Even today, Doré's legacy continues to assert itself in the realm of comic books and graphic novels, especially the "proto-graphic novels" he wrote at the beginning of his career. He was briefly romantically linked to Sarah Bernhardt. Similar artists includes Grandville, Daumier, Méryon, Victor Hugo’s drawings, Redon and more recently Paul Rumsey. Doré was born in Strasbourg and his first illustrated story was published at the age of fifteen. Doré began work as a literary illustrator in Paris. Dore's commissions include works by Rabelais, Balzac, Milton and Dante. In 1853 Doré was asked to illustrate the works of Lord Byron. This commission was followed by additional work for British publishers, including a new illustrated English Bible. Doré also illustrated an oversized edition of Edgar Allan Poe's The Raven. The Doré illustrated edition of The Raven is the first edition of Poe's most recognized poem. Doré's English Bible (1866) was a great success, and in 1867 Doré had a major exhibition of his work in London. This exhibition led to the foundation of the Doré Gallery in New Bond Street. In 1869, Blanchard Jerrold, the son of Douglas William Jerrold, suggested that they work together to produce a comprehensive portrait of London. Jerrold had gotten the idea from The Microcosm of London produced by Rudolph Ackermann, William Pyne, and Thomas Rowlandson in 1808. Doré signed a five-year project with the publishers Grant & Co that involved his staying in London for three months a year. He was paid the vast sum of £10,000 a year for his work. The book, London: A Pilgrimage, with 180 engravings, was published in 1872. London: A Pilgrimage enjoyed commercial success, but the work was disliked by many contemporary critics. Some critics were concerned with the fact that Doré appeared to focus on poverty that existed in London. 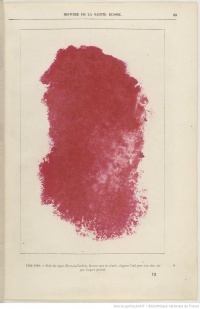 Doré was accused by the Art Journal of "inventing rather than copying." 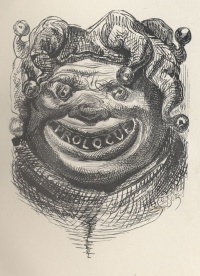 The Westminster Review claimed that "Doré gives us sketches in which the commonest, the vulgarest external features are set down." 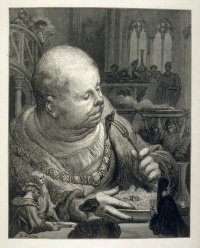 London: A Pilgrimage was a financial success, and Doré received commissions from other British publishers. Doré's later works included Coleridge's Rime of the Ancient Mariner, Milton's Paradise Lost, Tennyson's The Idylls of the King, The Works of Thomas Hood, and The Divine Comedy. His work also appeared in the Illustrated London News. Doré continued to illustrate books until his death in Paris in 1883. He is buried in the city's Père Lachaise Cemetery. 1863 Gastineau La Chasse au Lion et à la Panthère 1 vol. in 8vo Hachette and Co.
1867 Dante Alighieri Il Purgatorio ed il Paradiso Hachette and Co.
1866 X. B. Saintine Le Chemin des Écoliers 1 vol. in 8vo 450 Image:Le chemin des ecoliers title page.jpg(not all by Doré) Hachette and Co.
1866 John Milton Paradise Lost Cassell and Co.
1867 Les Fables de Lafontaine 2 vols. in folio 8 large and 250 small plates Hachette and Co.
1876 Louis Énault London 1 vol. in 4to 174 wood engravings Hachette and Co.
1874 Baron Ch. Davilliers L'Espagne in 4to 309 wood-engravings Hachette and Co.; London: Sampson Low and Co.
1875 Michaud Histoire des Croisades 2 vol. medium folio 100 grand compositions Paris: Hachette and Co.
1884 Edgar Allan Poe The Raven 26 steel engravings London: Sampson Low and Co., New York: Harper and Co. Unless indicated otherwise, the text in this article is either based on Wikipedia article "Gustave Doré" or another language Wikipedia page thereof used under the terms of the GNU Free Documentation License; or on original research by Jahsonic and friends. See Art and Popular Culture's copyright notice. This page was last modified 16:47, 17 December 2018. This page has been accessed 17,919 times.